a book that anyone who house shares with a cat can truly appreciate. Kevin the cat is very typical of his species. Great name too! Miss 3 and I like to explore different books and authors at the library, sometimes around particular topics or themes. 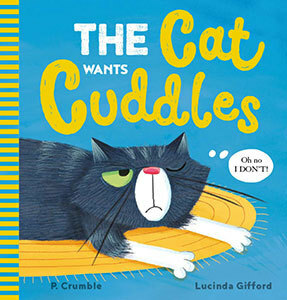 We try to get different ones out every week or so; it's fun for both of us to have the variety and to look at a mix of new & favourite authors.Picked this one up for a variety of reasons - we have a cat, Miss 3 spends part of each day pretending to be a cat, Miss 3 really likes cats. I think it's definitely a book that will amuse cat owners. It also rather reminded me of our cat at times, and definitely of Miss 3 who suddenly decides that she must claim ownership of my lap whenever our cat finally gets to settle down for a cuddle. Brilliant follow up work. You can feel exactly what the cat is thinking the whole way through this book.